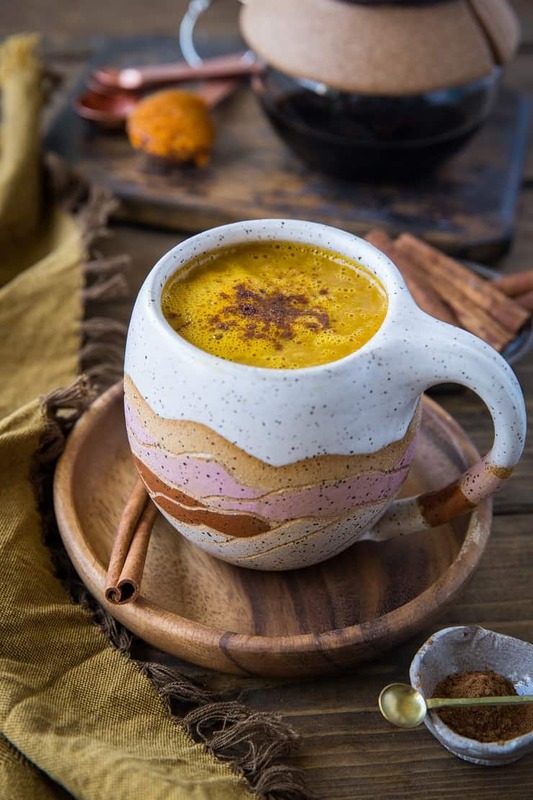 A creamy, delicious refined sugar-free paleo pumpkin spice latte to warm your belly and soul. This healthier version of the PSL is cozy and is actually quite nutritious! I find it comical how polarizing the pumpkin spice latte can be. Some people think it comes back in season too soon each fall, some folks prefer it were around all year, and some would rather it cease to exist and for all memory of it to be erased altogether. And some people rage feuds on Instagram over every permutation of possible opinion regarding the topic. I’m into the pumpkin spice latte, but truthfully only the homemade version. While I can admit to having a sweet tooth, I prefer my sweets to not be so sweet that they give me heart palpitations or a belly or a toothache. Case in point: I sweeten lightly and spice liberally. I make my pumpkin spice lattes bulletproof-style using strong-brewed coffee (I don’t have an espresso maker), Vital Proteins Collagen Peptides, ghee, canned pumpkin, pumpkin pie spice and cinnamon, pure maple syrup, and a little pinch of sea salt. It may seem like quite the laundry list, but I assure you, these ingredients have purpose. 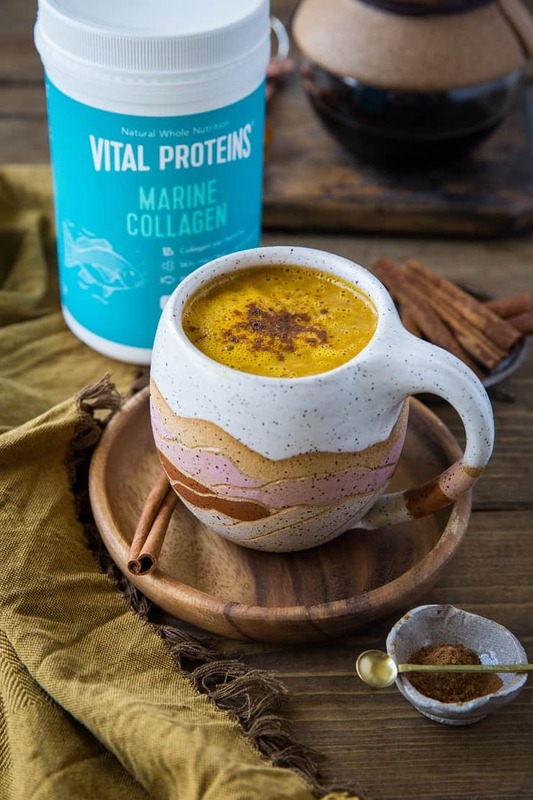 If you’ve been following me for a while, you know I put Vital Proteins Marine Collagen in my bulletproof coffee every single morning, so adding it to the PSL isn’t exactly a shocker. Collagen helps re-build damaged gut lining, which is the primary reason I incorporate it into my daily routine. 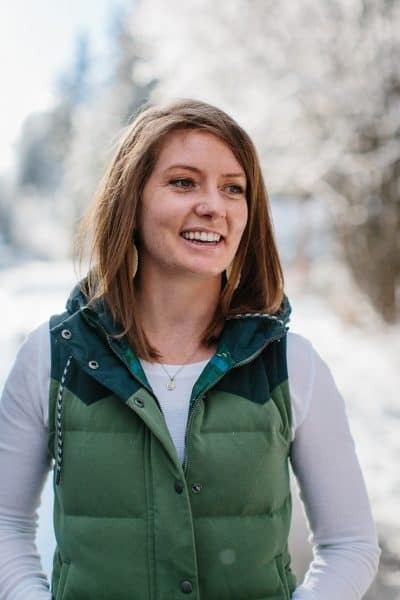 I’ve been healing from chronic gut issues for quite some time and my approach is to not add to any damage and also to heal from damage. Collagen is a most excellent tool for the healing stage. Secondary to collagen’s benefit to gut health, I love that it makes my nails and hair noticeably stronger (and they both grow super quickly!! ), and my skin heals quickly from any blemishes or scratches. Collagen is, after all, the most abundant protein we need in our body in order to maintain and build healthy tissue, bones and joints. I’ve also found since adding collagen to my diet, I have experience far fewer knee issues (I used to have a chronic knee injury from running). Okay, so with all that said, how do we make this homemade healthy pumpkin spice latte? Simply toss all the ingredients into a blender and blend for 2 minutes (yes, two) to make it nice and frothy. 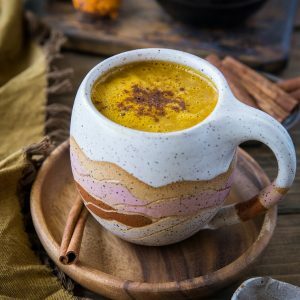 Once you’ve whipped up your first paleo pumpkin spice latte, you’ll want to give it a taste test to see if it’s sweet enough for you. Adjust the measurement of pure maple syrup to your own personal taste buds. You can even add a dollop of homemade coconut milk whipped cream if you’re jonesing for something extra special. I also add Vital Proteins Beef Gelatin to my coffee along with the collagen peptides, so keep in mind that is an option too! If you love mocha flavor, you can also add some mocha jazz to the mix by using Vital Proteins Mocha Creamer. Add some full-fat canned coconut milk or use coconut oil instead of ghee to make this vegan. Use your favorite liquid sweetener. I prefer pure maple syrup, but you can also use honey, coconut nectar, or a sugar-free liquid sweetener. If you love a good coffee treat, you can check out my Naturally Sweetened Caramel Macchiato I posted a number of years ago as well. And that’s it! 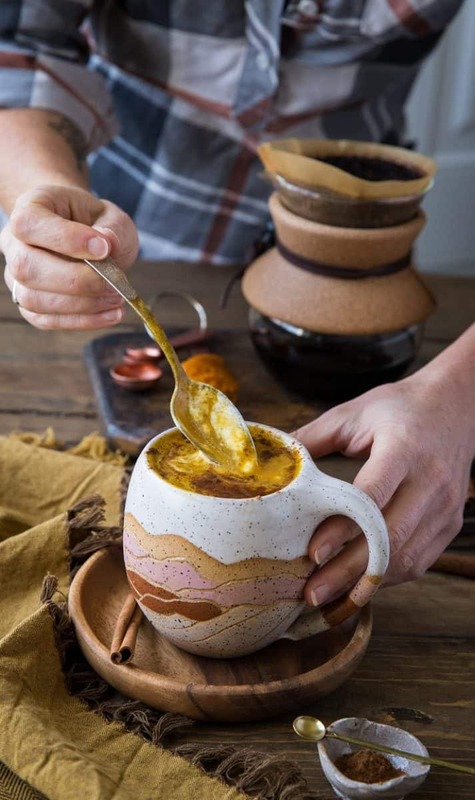 A cozy hot beverage to make your tastebuds dance and sing during the fall and winter months. Let me know if you try it, how you like it, and any changes you make to customize it! 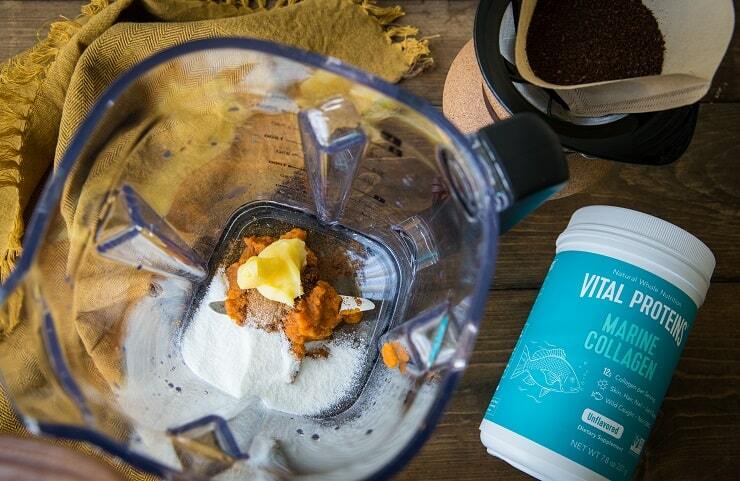 Add all ingredients to a high-powered blender and blend for 2 minutes. Pour into a rad mug and sip! 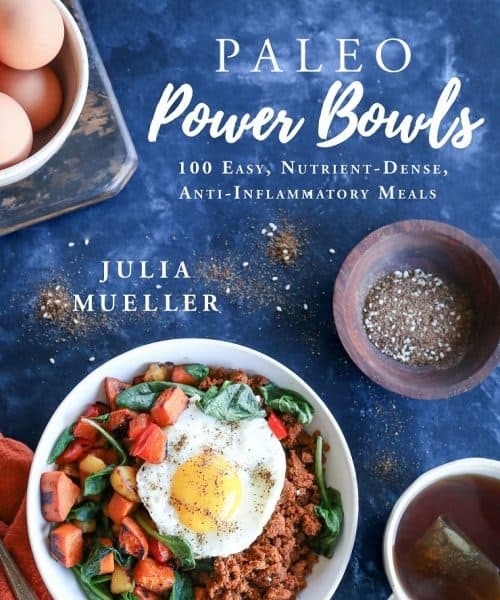 Julia, can you help me understand your love of “Marine” Collagen? I have heard of the kind derived from animals, but this is new to me. I’d love to know why you went with the marine version. I happened onto your blog and just love it. Where is that lovely mug from?!! ?